1) This time yesterday I was…? Comment: “He said really I just want to dance good and evil match perfect, it’s a great romance, and I can deal with some psychic pain, if it will slow down my higher brain…” hmmm…not sure what to make of that. Did I dance with evil yesterday? I did make a McDonald’s pitstop along the way. Maybe it does fit! 2) This time tomorrow I will be…? Comment: “Walking in the breeze on the plains of old Sedona, Arizona among the trees.” Guess I’ll be daydreaming about AZ tomorrow. 3) This time next year I will be…? Comment: “I’m so tired I haven’t slept a wink, I’m so tired my mind is on the blink, I wonder should I get up and fix myself a drink…” So this time next year will be basically the same as today. Good to know. Thanks Sheena! Wave of Mutilation popped on yesterday. Haven’t heard them in ages. Still sounds great. Truly! Another soul searching edition of Music Monday. Thanks Steve! 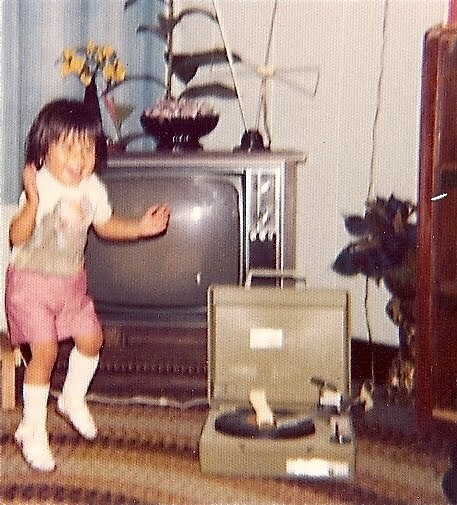 Grandma had a record player to keep you dancing and happy. You didn’t need a stereo yet, I can tell. Yes, same goes for me, Sandra. My favorite, though, is live, simple instrumentation, grass-roots style. In my past life, I put together a video series of original Central New York music, bands in a plain white studio to video camera microphone. And people loved it. I think you can find it by googling my name + syracuse.com + Music Notes Performance. That series was a sweet responsbility. Nice! I will definitely check it out! Can I also find the Natalie Merchant/10,000 maniacs review there? No, that came before the company added the web site, decades ago. But I did dig up this link to a video I oversaw. It includes twins, a ukulele, and a percussionist in a hat. Let me know what you think, Sandra. I love it! Zombie Rock Opera…sounds amazing. I like the song that was featured too. Thanks for sharing this Mark! That particular video was posted the day before I was laid off. I will forever hold it in high esteem. The Goldsworthy sisters are wonderful performers, both. Thanks, Sandra. A great performance. Unfortunate to hear you were laid off. I hope the change ushered in new opportunities. Yes, it did, and this WordPress blog is one of them. It’s hard going, though. I was at that company for just shy of 30 years. The reinvention of my professional self is coming along, with film blogs, community blogs and various rewarding free-lance writing. A 40-hour position may be coming soon, knock on wood, to add to the foundation. Thanks, Sandra. You remind me of my oldest daughter. The first thing she did when she got up each morning was turn on her record player. Yep, that sounds like me too!